J.D. WILKES AND THE DIRT DAUBERS with ROD HAMDALLAH and special guests. Wild Moon, the third album by J.D. 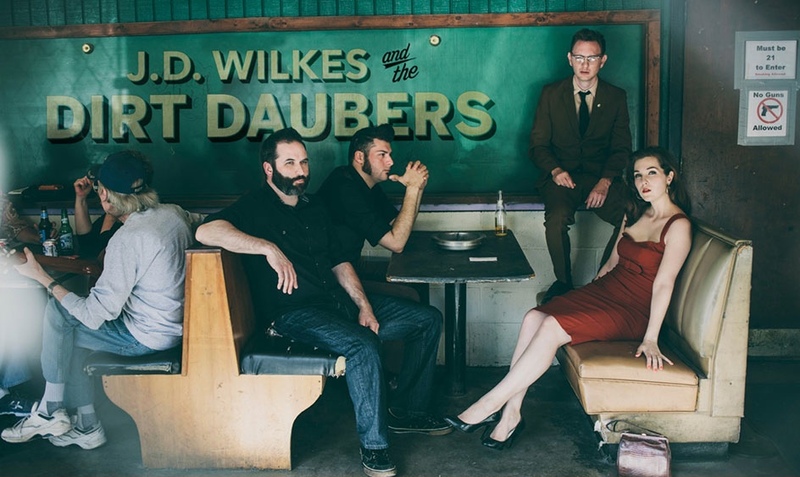 Wilkes and The Dirt Daubers, find the previously old-timey, acoustic group plugged in and wailing away on raw, blissfully distorted rock-n-roll and blues. The Dirt Daubers were formed by Legendary Shack Shakers front man, artist, director and country punk pioneer J.D. Wilkes in 2009 with his wife Jessica Wilkes. Wilkes’ “gothic preacher” persona and frantic blues harmonica whips Wild Moon into a frenzy, trading lead vocal duties with his feminine foil. J.D. and Jessica are joined by electric guitarist Rod Hamdallah and drummer Preston Corn. Smoky baritone sax grooves are provided by Tom Waits’ sideman Ralph Carney, with piano played by Wilkes himself - delving deeper into the bluesy recesses of American music. Jessica emotes pained lyrics about life, love and loss on tunes like “No More My Love” and “Apples and Oranges,” while J.D. continues his southern storytelling style on “Angel Crown” and the title track.